Implementing a Pipeline Safety Management System will help you meet requirements, be compliant and operate safer. Embedding organizational requirements into day-to-day operations and establishing a culture of continuous improvement. Efficient audits and fit-for-purpose Assurance Programs to provide you peace of mind that you're operating safely. Implementation and rollout of important programs supporting workers in high risk activities. Map all important regulatory requirements and standards to your management system and programs to prove you meet them. We improve performance through the implementation of management systems, programs and assurance activities. These programs are fundamental components for proving compliance and improving performance. Our designs and fit-for-purpose methods are guaranteed to successfully implement your programs and achieve your goals. We are known as implementation experts because we find the right approach, build momentum and achieve success. We pride ourselves in being modest, humble and empathetic to your situation. It is never easy for any organization to make change happen, so we start small and work with you to find the best way to achieve success. 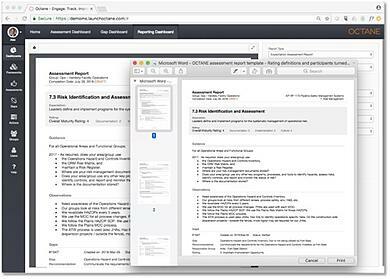 Pipeline Safety Management Systems and Operations Management Systems - In the current business environment, organizations face ever-increasing challenges to meet compliance requirements and manage risks. SPAN designs and implements Management Systems that embed consistent organizational requirements into day-to-day operations and establish a culture of continuous improvement to demonstrate compliance, risk management and performance. Today’s organizations are complex and it is becoming more difficult to design and implement effective programs to manage new requirements, leading to change overload. Our program implementation methods are effective in using the best of our knowledge and experience, matched with your organization's way of operating, to achieve implementation success. Providing assurance that you are operating safely, meeting compliance requirements and improving operations is a must-have in your organization; otherwise you just don't know. But it must also be cost effective and not overly impact operations, so properly implementing your assurance activities is paramount. Our audits and assurance programs are risk-based, resource-optimized and integrated, helping you achieve a win-win with stakeholders and your organization. Understanding important requirements that apply to your organization is necessary but almost impossible! You need to know what applies, who in the organization they apply to, which programs address them and how you assure you are meeting them. SPAN has created a unique service where we help you map important requirements to your management system, programs and organization. Using our Octane software Mapping module, we can create mapping reports, develop integrated audit protocols and generate assurance reports for new requirements from existing assurance data. SPAN HAS COLLABORATED WITH AN EXPERT SOFTWARE DESIGN COMPANY TO CREATE OCTANE. Octane is a cloud-based software tool that helps you implement and sustain your management system. 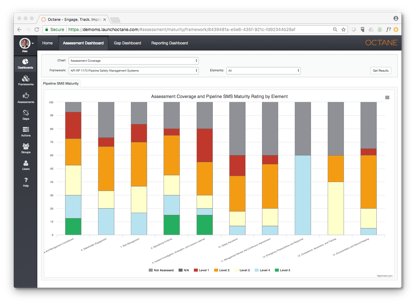 You can map all relevant requirements, conduct assessments, track gaps and actions and provide real-time analytics, reports and dashboards, all in one tool. Patrick Smyth, VP, Performance, CEPA - Canadian Energy Pipeline Association. SPAN provides the following skills and expertise to support our core services and provide value-add client solutions.